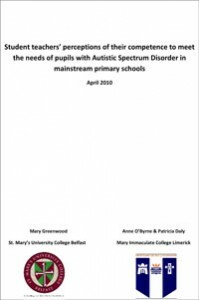 To establish how well prepared BEd primary students feel they are in addressing the needs of pupils with ASD through the teaching element of the BEd course. To ascertain how much BEd primary student competence in the field of ASD is enhanced as a result of their time spent on school experience. To examine data gathered from the BEd primary students so as to establish whether there are observable differences between students in the two jurisdictions in order to make comparison.